Over 16,000 people in Nottinghamshire are known to be living a life blighted by chronic smoking-related lung diseases. Around 7,000 additional people are living with these diseases but not known to their GP and therefore not being treated. Public Health officials at Nottinghamshire County Council are highlighting the debilitating nature of serious lung diseases for which smoking is the biggest preventable risk factor, after the latest GP figures reveal that the number of people diagnosed with COPD in Nottinghamshire reached 16,441 in 2014/152. Nationally, over a million people are living with COPD3. 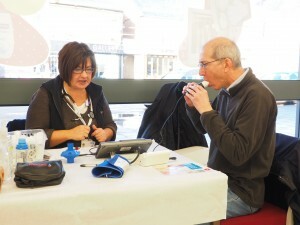 Estimates suggest that there may be up to an additional 7,000 people in the county living with COPD4 but who are not known to their GP and are therefore not getting the treatment they need. COPD is the umbrella term for serious lung conditions that include chronic bronchitis and emphysema. People with COPD have difficulties breathing, primarily due to the narrowing of their airways and destruction of lung tissue. Typical symptoms include breathlessness when active, a persistent cough and frequent chest infections. To highlight the impact of this progressive and debilitating disease, PHE has released a new short film in which four smokers take part in an experiment to illustrate the difficulties of living with advanced COPD and urges people to quit this New Year. Alongside the impact on quality on life, 1,220 deaths in Nottinghamshire between 2012 and 2014 were attributable to COPD6. At 52.5 deaths per 100,000 population, the Nottinghamshire figures are similar to the national average of 51.7 deaths per 100,000. Around 86% of national COPD deaths are caused by smoking7. Dr Charlotte Bolton, a lung doctor specialising in COPD at Nottingham NUH Trust and joint Clinical Lead of the East Midlands Respiratory Programme, said: “For someone who has smoked for many years, stopping smoking can be a big challenge. However, it is so important that we support people in stopping and let them know what options there are to help. The key is for smokers to seek advice. “If smoking is stopped early enough, it may prevent COPD occurring. For those with COPD, stopping smoking is one of the main ways of slowing the progression. I see people with COPD in my clinics with a range of breathlessness and also limitation in what they can do. Patients with COPD also are more prone to flare-ups – “exacerbations” and sometimes these need a hospital admission. Quite frequently, my patients comment that – if only they had known about COPD, how it affected people and had stopped smoking earlier. Got an opinion about Mental health services?